Does it feel good when you start making something that you have been buying from the store for years? Yeah, I know, it does. I remember the first time my mother taught me how to make “Pate Brisee” (flaky pie pastry), I felt so special. Or the first time I made Cheese Soufflé (that was my first dish entering the world of cooking), the time I made Yoghurt and the time I made Granola. I remember the first time I made my own bread, I was fifteen and my Nana couldn’t stop talking about it during the whole dinner. My grandmother was a “do it yourself” type of person: “If you can do it yourself why bother buying it from the store!” she used to tell me. She used to make her own butter; don’t ask me the recipe it’s a family secret. She also used to make her own Orzo; she rolled it between her fingers and tossed in a big sieve instinctively without even looking at it, while talking to my mother about the latest gossips in the family. She was incredible. I try everyday to follow her path; but not the rocky path of making my own butter and things that demand having a cow in my apartment, no! I have chosen the smooth path with bumps from time to time but always an exit in case of a bad traffic. 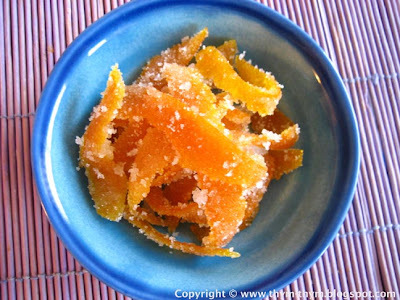 Lately, I learned how to make Candied Orange Peels which I am excited to share with you. I used to hate candied fruits peels; I found them too sweet, sometimes too gooey or too dry. But with this recipe I know that I will never go to back to buy candied fruits again. Because mine are so much better, with all modesty of course, and so easy to make. Candied peels of lemon and grapefruit can be done in the same manner. They are excellent served with ice cream, poached fruit or dipped in melted chocolate. Dip half of the orange rind in chocolate and leave the other half plain to have a contrast of colors and taste. 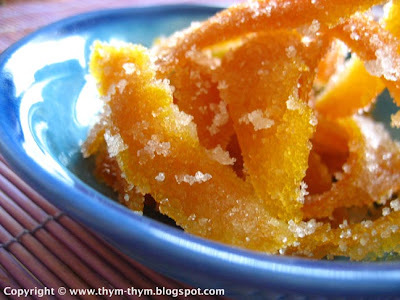 I have already used those candied orange peels in a recipe that I will be posting soon. Using a vegetable peeler, remove 10 wide strips of zest from an orange. (Do not remove the white pith underneath.) Slice each zest into ¼ -inch-wide julienne strips. Put the strips in a saucepan and cover with 2 cups of water. Bring to a boil and cook for 10 sec. Drain and rinse the strips under cold water. Return the zest strips to the saucepan with 1/3 cup of sugar and 2/3 cup of water. Bring to a boil and cook, uncovered, until the mixture starts to thicken and turns into a syrup. The strips should be almost transparent and there should be almost no liquid left. Spread some sugar on a tray. Toss and separate the strips in the sugar until each piece is well coated. Transfer the strips to a plate and let stand for at least half an hour, until dry and crisp. When cold, store them in a jar with a tight-fitting lid. Refrigerated, the strips will keep for months. Serve them on your dessert at the last moment, otherwise they will get wet and the sugar coating will dissolve. Avec un couteau econome, peler 10 larges bandes de zest d’oranges. (Eviter d’enlever la partie blanche de l’orange) Couper chaque bande en julienne d’un centimeter de largeur. Metrre les zets dans une casserole et couvrir de 500ml d’eau. Porter a ebulition et faire cuire pendant 10sec. Egoutter et rinser les bandes sous de l’eau froide. Remettre les bandes de zest dans la casserole avec les 30g de sucre et les 60ml d’eau. Porter a ebullition et laisser cuire sans couvert jusqu’a ce que le mélange s’apaississe et devienne un syrop. A ce stade les zests doivent etre Presque transparents et le liquide se serait evapore completement. Etaler du sucre sur un plateau. Mettre les bandes de zests dedans et couvri de sucre tout en prenant soin de bien separer chaque bande. Transferer les bandes de zest dans un plat et laisser secher au moins ½ heure, jusqu’a ce qu’elle deviennent croquantes. Quand elles auront completement refroidi, les ranger dans un bocal a fermeture hermetique et mettre au frais. Il se conserveront pendant des mois au frigo. Les servir sur vos desserts au dernier moment pour eviter qu’elle se ramolissent. je n'aime pas les fruits confits en général, mais j'aime beaucoup les oranges confites enrobées de chocolat... je ne prends cependant pas le temps de les faire moi-même ! Merci pour ta visite Claire. J'aimerai bien voir quelles sortes de petits pains tu fais. I can say that the title is perfect! Nothing to waste at all -- that's one of the goldmine recipes of the year for me (this and the vinegar) because they make use of everything with great results. I just made my first batch tonight and it's marvelous.